Ok, i LOVE the design details in science fiction. 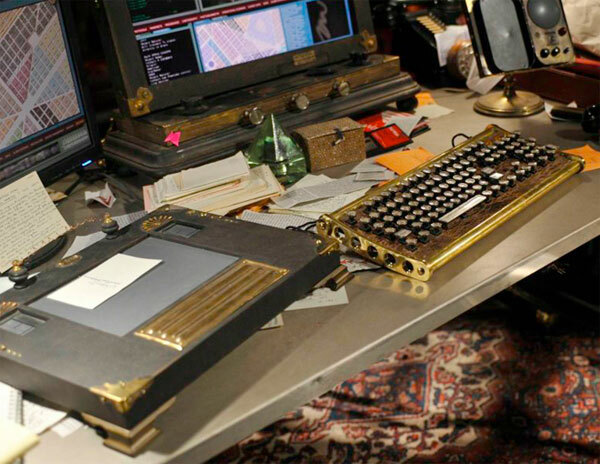 This morning i was so half awake, i started things off catching up on the new Syfy show Warehouse 13 to ease into things… and couldn’t help but fixate on the STEAMPUNK WACOM TABLET! I mean i love all the bizarre archaic gadgetry (Wired has a nice look at them)… but its the tablet and keyboard that got me first. 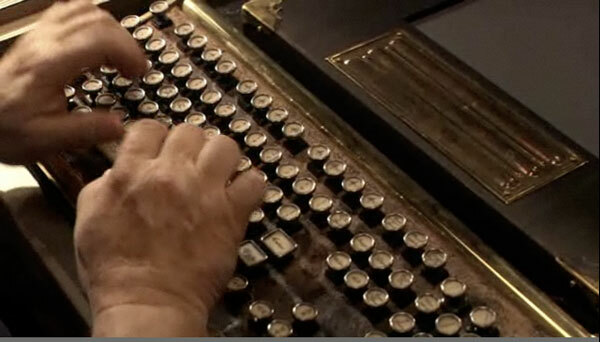 Also… i love how small the internet is, while looking up past steampunk keyboard, found out that the keyboard was made by Datamancer - “prestidigital datamancery & paraphrenalic technofetishism” ~ and the exact keyboard in the show is “the Sojourner keyboard I built for my girlfriend 2 Christmases ago” - and he “hope[s] the show becomes very popular so they commission me to build them some more elaborate contraptions for future seasons (I’m actually designing a Version 2.0 of my old Computational Engine PC right now with them in mind)”… So fun to hear how these shows pull in awesome design for even the tiniest details… see more pics on the next page! The other steampunk stuff on the show is probably made by the same guy. This keyboard was so superb; it was love at first sight. My own Mac keyboard/Wacom pad combo is stuck together with canvas board and duck tape so it can sit on my lap when I work. I’d been Googling for a place that sold the steampunk style (retail), since I know I don’t have a sufficient level of workmanship to make one myself. Here’s a business opportunity literally hand-made for people with the right skills. Love the keyboard. I would buy one in a heart beat! 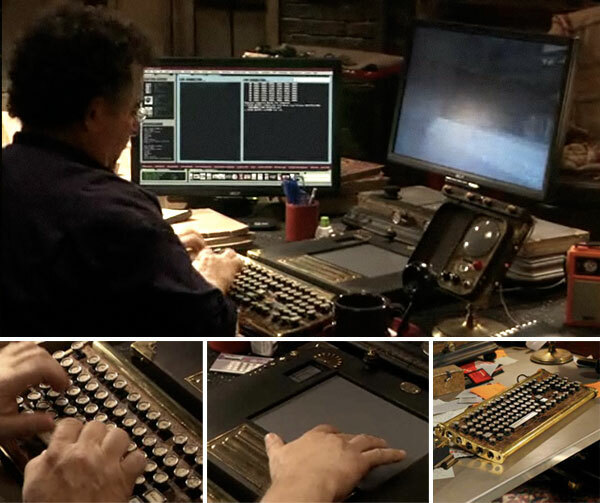 I’m not a steampunker but I noticed that keyboard right away as well and went back to watch it again and searched “Warehouse 13 steampunk” and got this site. Being a guy, I love shows with secret laboraties. Maybe going back to Wargames or later finding The Andromeda Strain with the farmshack that is a downward elevator when pulling on a shovel on the wall. “Fringe” on Fox has a great lab in a basement at Harvard. And a better mad scientist as well. If Warehouse is a goofier x-files spinoff, then Fringe is closer to the source material. Anyway, Warehouse gets many points for the steampunk setup. visually to me the selling point is the keyboard. The lovely circular and oval keys are the main detail that stands out. It must have taken a while to custom make that though, awesome stuff!. Well, There it is my friends. The great Steampunk work of our very own Datamancer! Thanks for the post. The show ~ it was fun! 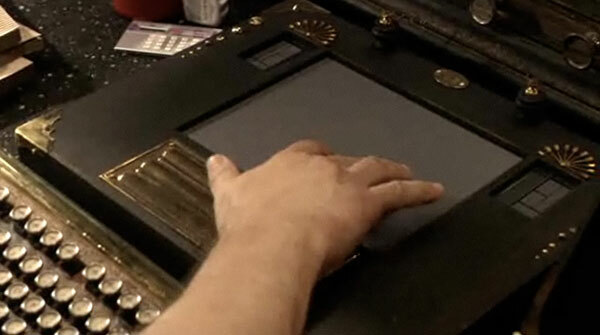 As with most science fiction shows, it takes me a few to warm up to them, but i always love the gadgets!!! and the world of possibilities they present? Will see how the next few episodes go before deciding if i’d watch it regularly? Was the show any good as was just reading about it?! !